An official blog maintained for the Hermetic Order of Golden Dawn, an international magical fraternity dedicated to training Initiates and providing resources to students of the Western Esoteric Tradition. No flame-wars or disparaging of others will ever be tolerated or posted here. 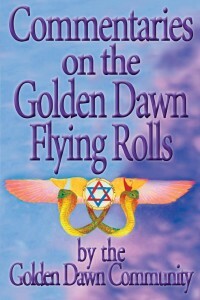 New Book: "Commentaries on the Golden Dawn Flying Rolls"
"This book is a cooperative effort between members of various Golden Dawn orders and temples who wish to make the teachings of our beloved tradition more accessible to the public. Each of these essays, on the Flying Rolls of the original Golden Dawn, were chosen by various practitioners in the wider Golden Dawn Community to provide a commentary. Some of the commentaries clarify the material while others expand it into new, fresh horizons. Each of these commentaries capture the flavor, insight, and the approach of their respective author." The Hermetic Order of the Golden Dawn is an International Order headquartered in the USA with temples across the globe. Established by Chic Cicero in 1977, the HOGD received initiatory lineage to the original Golden Dawn in 1982 through Israel Regardie, the modern-day Order's mentor and Guiding Light. Many adepts of the HOGD are prominent esoteric authors and respected members of the greater Golden Dawn community. The Hermetic Order of the Golden Dawn, Inc. is a Florida non-profit corporation founded in 1988 by Charles "Chic" Cicero. HOGD, INC. has always been and continues to be the sole and exclusive owner of United States Trademark Registration No. 2,034,866, for the trademark "The Hermetic Order of the Golden Dawn" and design. The new revised and expanded 10th Anniversary Edition of Isis Magic is finally available. Why is Yesod Air and Hod Water? All views expressed on this blog are those of the author alone unless otherwise stated.